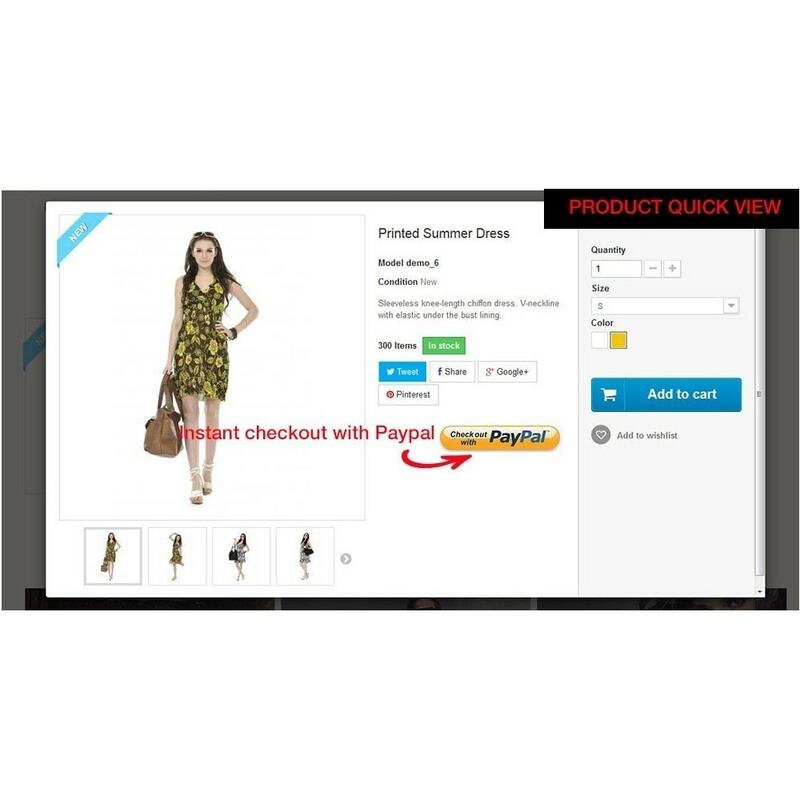 Paypal Instant Checkout allows the current product to be checked out in 1 click. It also offers an ability to check out the current basket in 1 click. Easy with a Paypal account. 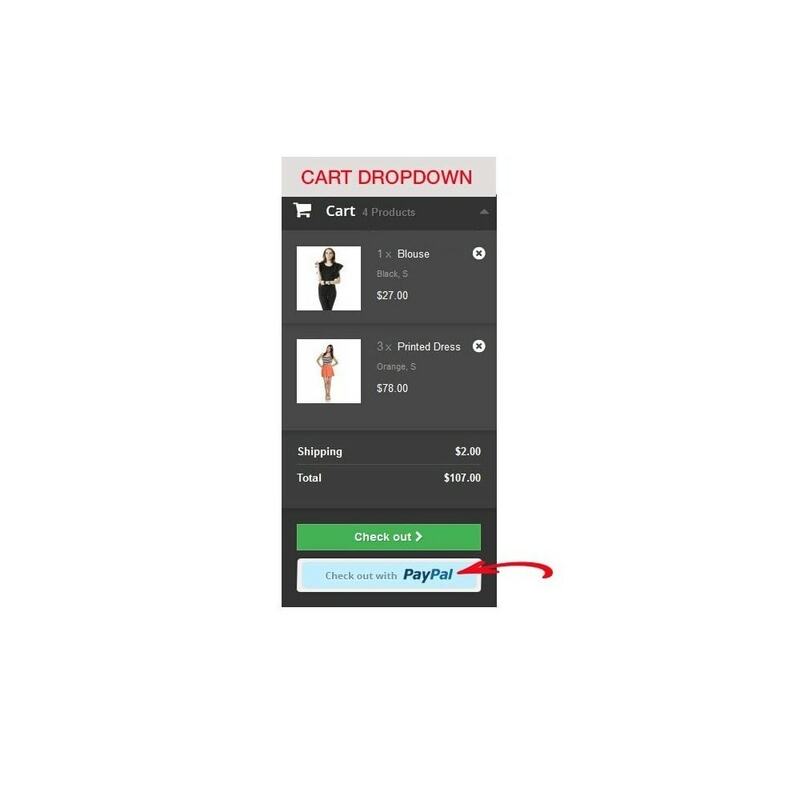 Offer Paypal checkout with 1-click and immediately from the product page. 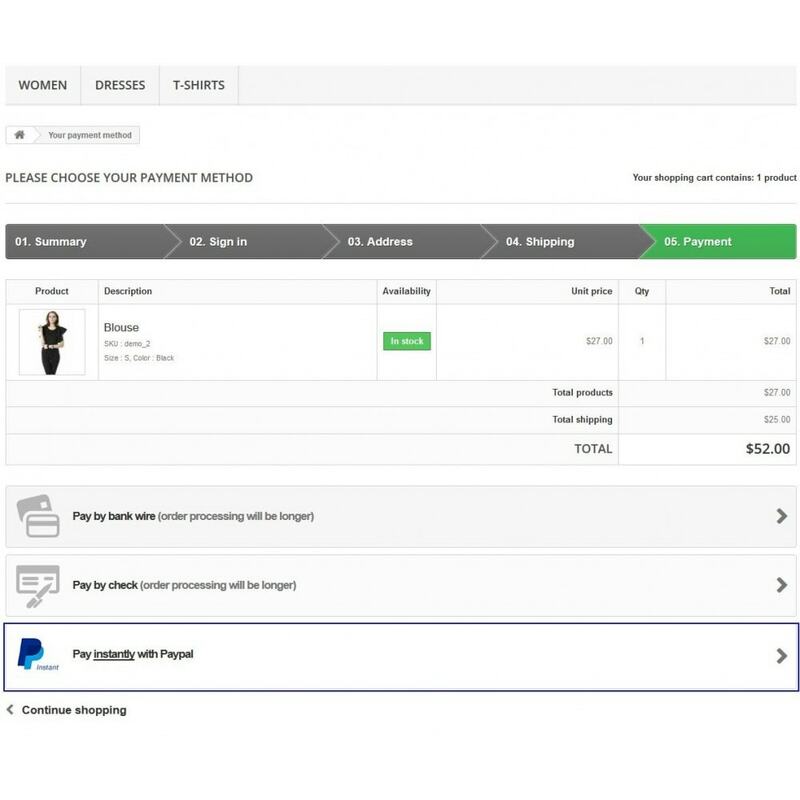 Offer Paypal checkout with 1-click and immediately from the basket summary. 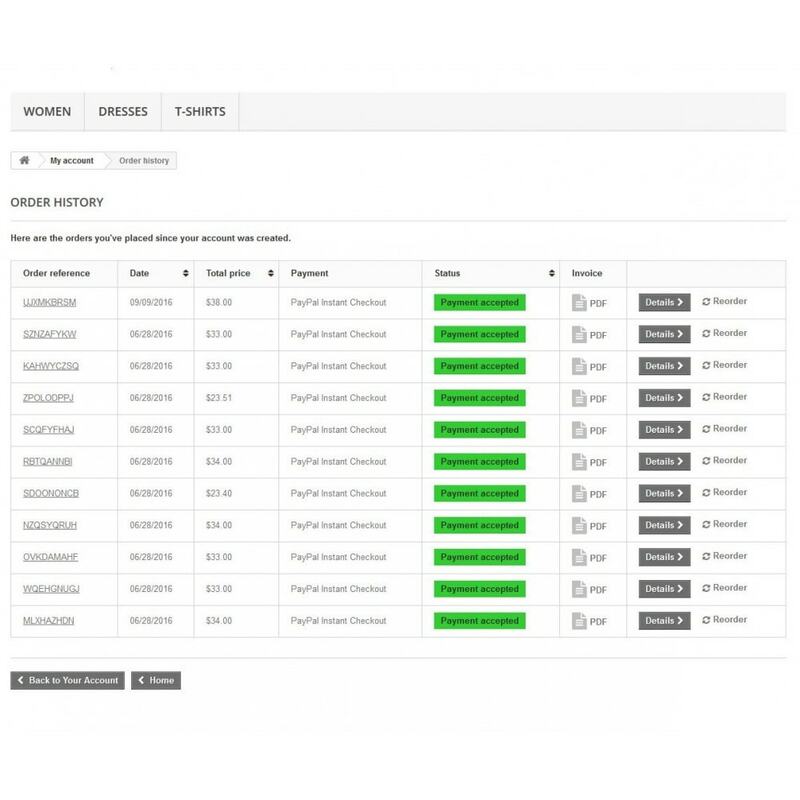 Create a standard order so that you can control all orders in one place. 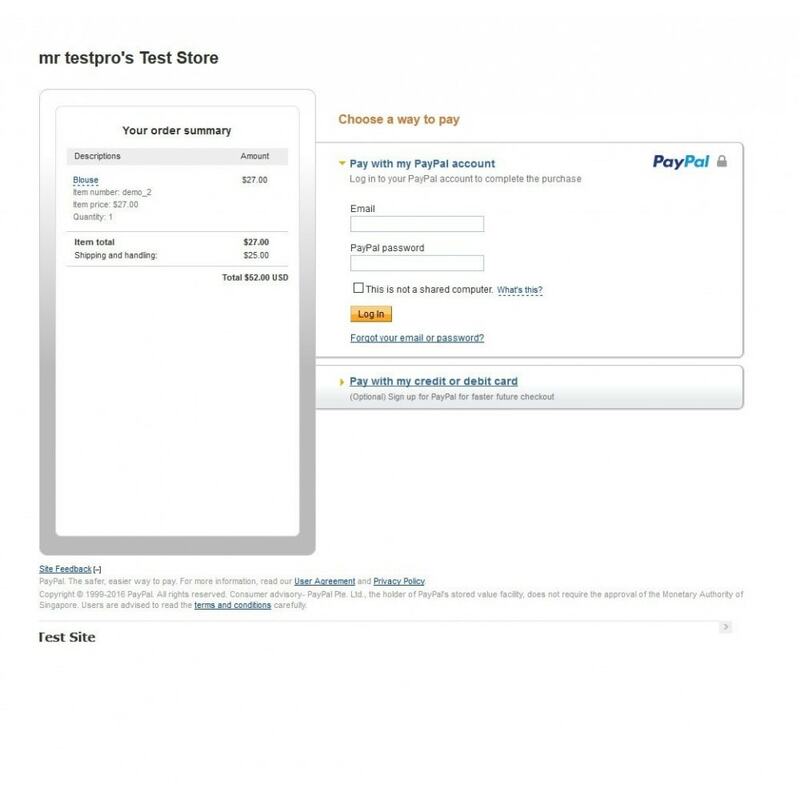 Automatically create a user account - sync with his/her Paypal account. Easy to manage as well. 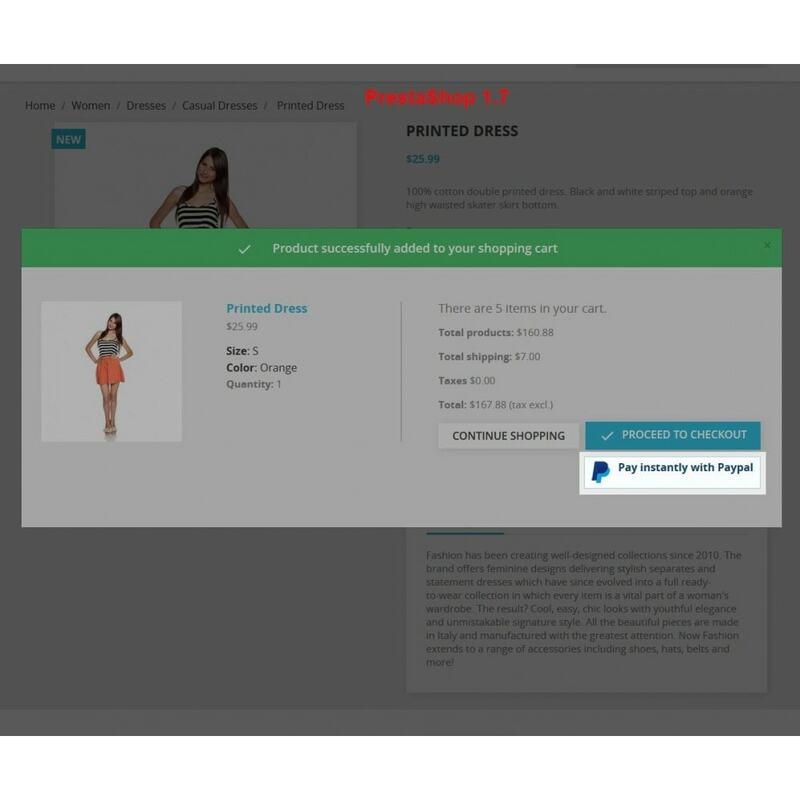 Offer a separated confirmation page, and customers/visitors can update their information after checking out. Your visitor is viewing an item and being crazy to check it out? 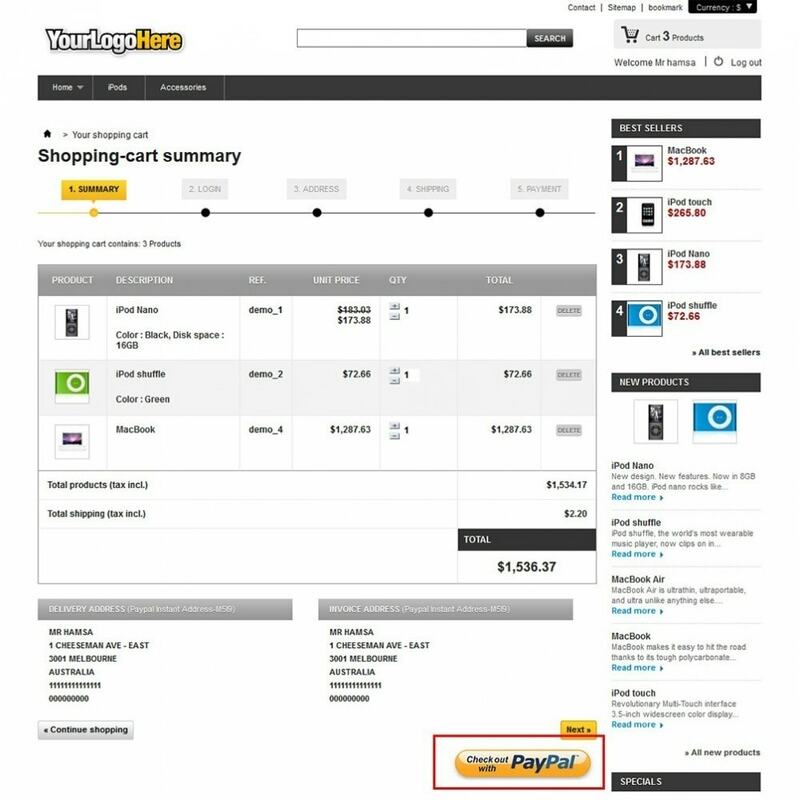 He now, or adds the item to basket; or even faster and easier, completes the order immediately with Paypal. Forget about 5 step checkout. No logging-in. No address. 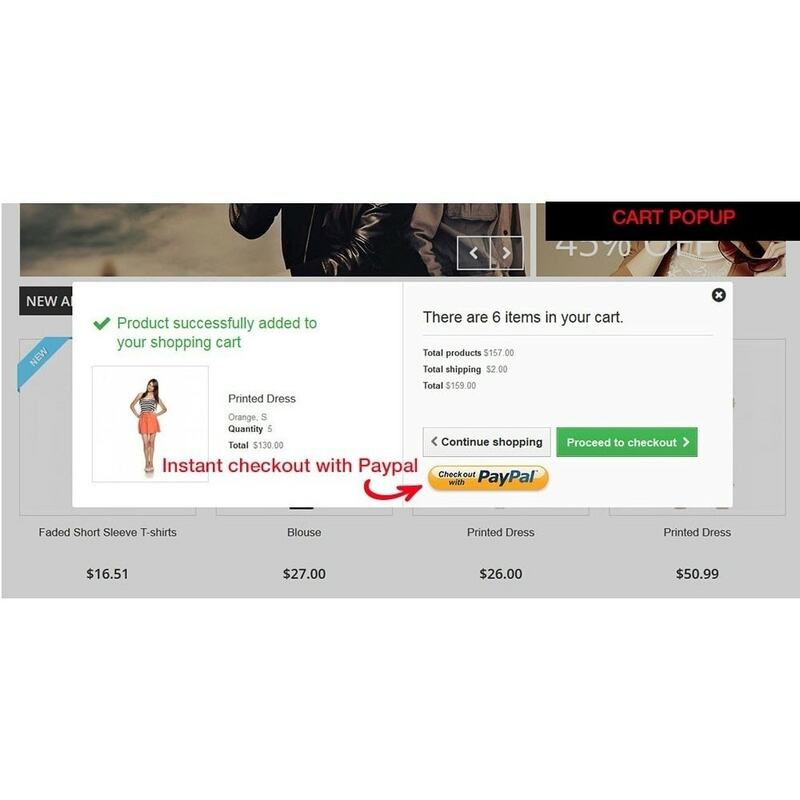 Paypal Instant Checkout is ready for you. Click and finish the order in seconds. 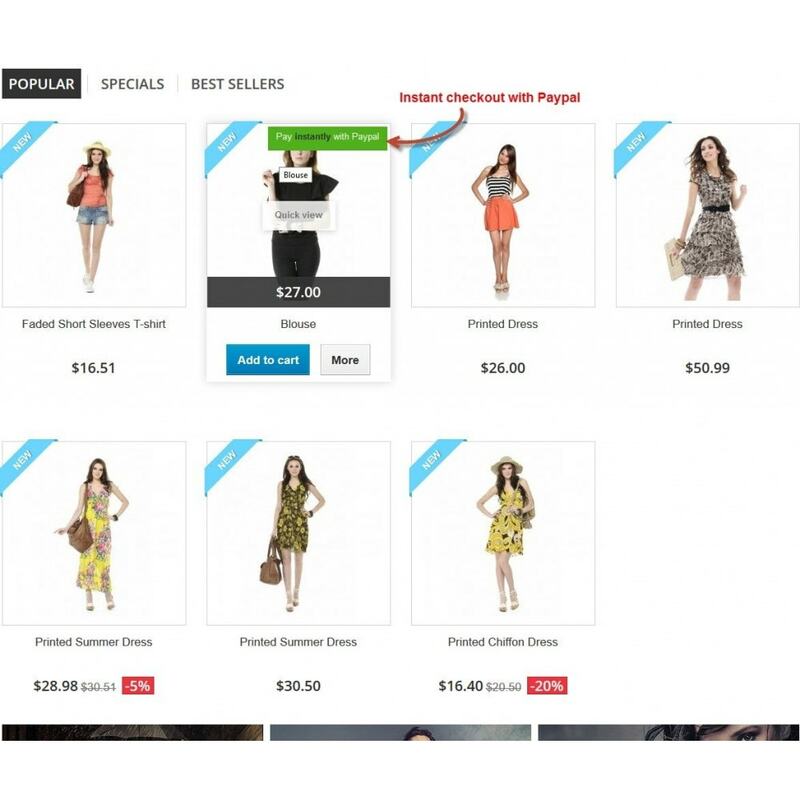 Especially, your customers are always able to complete the order in 1 click regardless where they are on the website. 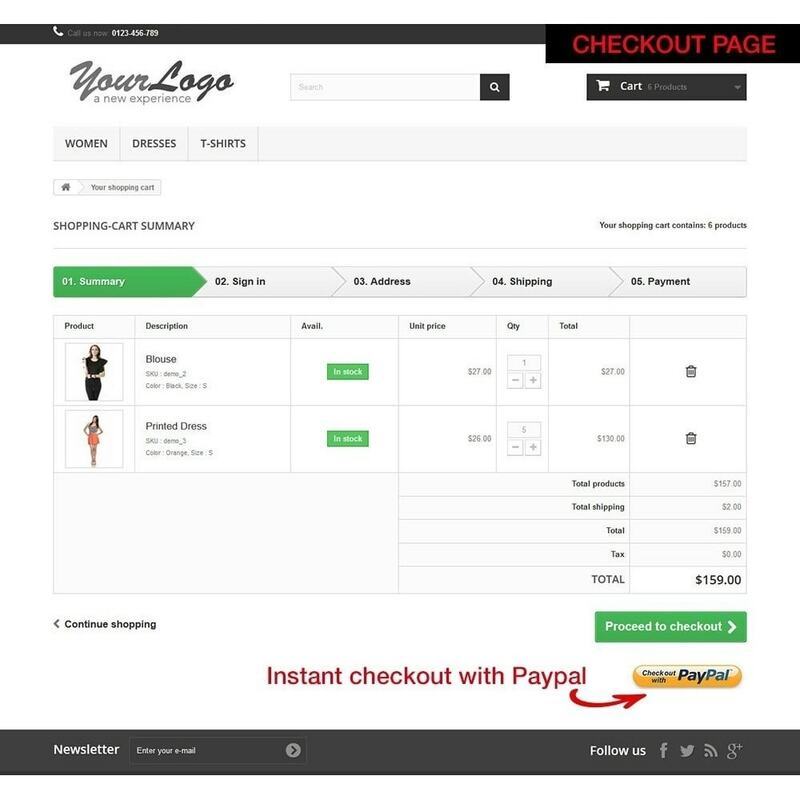 Paypal Instant Checkout option is tightly paired with your shopping cart. 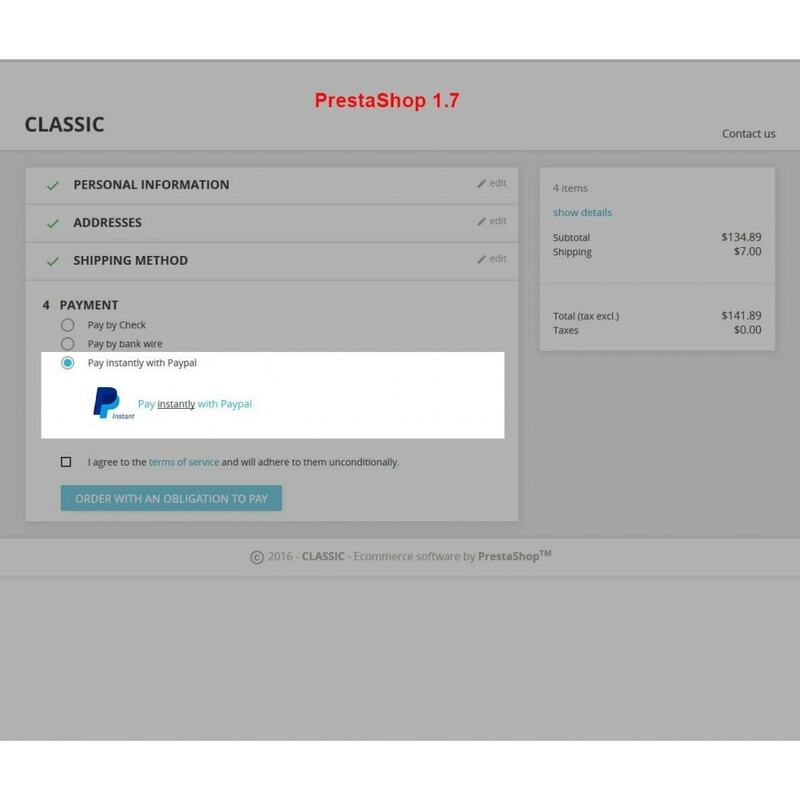 Orders made through Paypal will present in Prestashop back office too. Custom information will be pulled from Paypal gateway in secure. 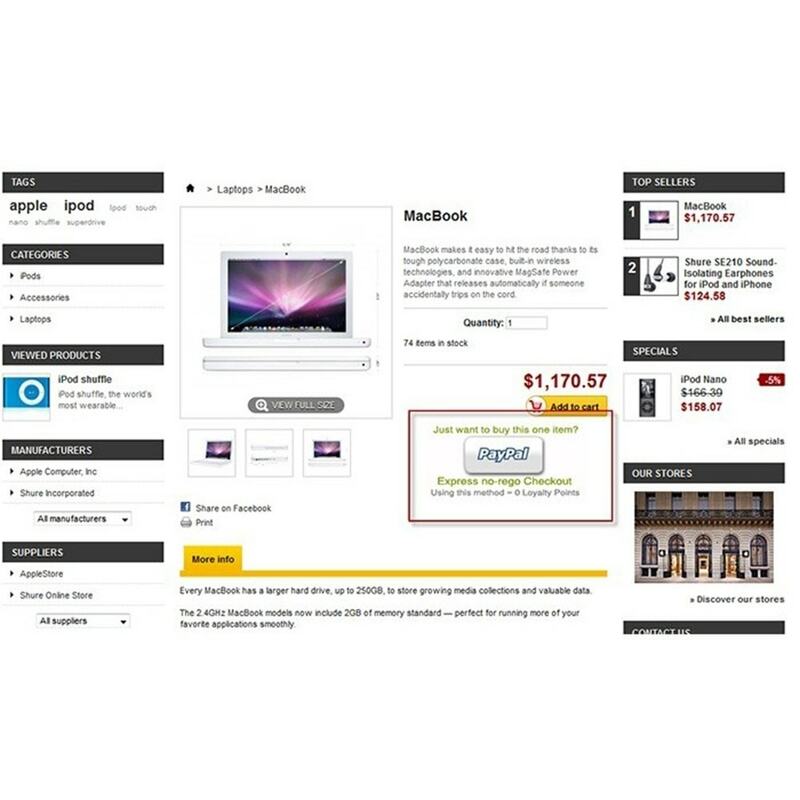 What if that customer already opened an account on your site? No worry about duplication. Paypal Instant Checkout takes care of that. This option can be turned on / off directly in back office. Sometimes, your customer might want to update his information, such as adding a phone number or changing address. Yup, we understand how important it is for shipping stuff. And he is given a chance to accomplish it after purchasing. Of course, this is optional. No noise. Logging-in is NOT required to checkout. No need to add a product to cart. Just 1 click and check out. No need to go through all steps of checkout process. Just login and pay. A standard customer account will be created automatically and it's ready to use in future. Offer a chance to change account info after an order was made. These guys done a great job I had a small problem at my end they sorted it so quick and a great response time would recommend Thanks to the team.